Go short following a bearish price action reversal upon the next touch of 0.9985. Go long following a bullish price action reversal on the H1 time frame immediately upon the next touch of 0.9907 or 0.9885. I wrote yesterday that the overall picture was muddled and messy and I thought trading this pair was going to best avoided. The trend line might have hold as resistance, but there was a support level so close by I saw it as more likely to ultimately break. This was a good call and predicted accurately the day’s action, but it was not much use. I am a little more bullish today as there is nothing obvious to stop the price rising, provided that the support level at 0.9907 holds. Even if it breaks, 0.9885 could work as support too. 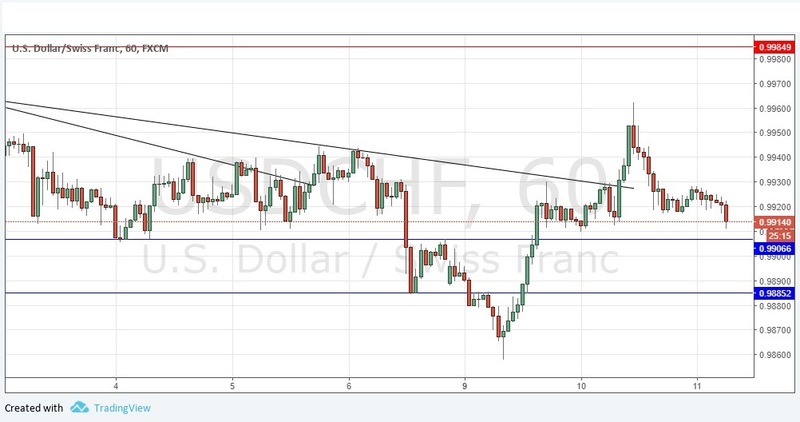 There is nothing important due today regarding the CHF. Regarding the USD, there will be a release of Crude Oil Inventories data at 3:30pm London time.